* Neighbourhood-by-neighbourhood summaries loaded with adventure hooks, from the flooded slums of the Puddles to the temples of failed gods in the Ascendant Court. * Key movers and shakers in the city, and their eternal shadow war for ultimate control. * Detailed information on organizations both good and evil, from the Smoke Knights to the Gillmen. * Descriptions of daily life in the city, including cost-of-living information by district. * Information on the ruined siege castles of the Cairnlands and the Absalom's other holdings. 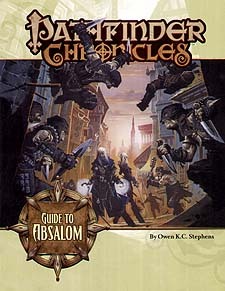 Except for a short chapter on Absalom's secrets, all of the information contained in this book is safe for players in any fantasy campaign, and is compatible with any edition of the world's most popular roleplaying game.